Beatriz Mourad, Michelle Anderer, John McKenna, and Steve Zec discuss the first three episodes of the Netflix anime, “Devilman Crybaby.” WARNING: Rated M for Mature. Beatriz Mourad & Dylan Hysen review and recap the Studio Ponoc (Studio Ghibli legacy) film, “Mary and the Witch’s Flower”. 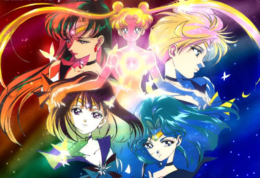 Beatriz Mourad, Michelle Anderer, and Steve Zec discuss the Infinity Arc of Sailor Moon. Andy Potter and Steve Zec discuss the third and probably darkest season of Digimon, Digimon Tamers. Dylan Hysen, Beatriz Mourad, April Collins, and Steve Zec recap the final four episodes of Little Witch Academia: “Things We Said Today”, “Yesterday”, “A Road to Arcturus”, and “Changing at the End of the World”. Dylan Hysen, Beatriz Mourad, and Steve Zec recap episodes 18, 19, 20, and 21 of the Netflix anime, Little Witch Academia: “Starship Take Off!”, “Cavendish”, “Intellect and Sensibility”, and “Discipline”. Justin Cummings and Andy Potter look back on the 2013 anime, “Gargantia on the Verdurous Planet”. Dylan Hysen, Beatriz Mourad, Steve Zec, and April Collins recap Episodes 11, 12, and 13 of Little Witch Academia, “Blue Moon”, “What You Will”, and “Samhain Magic Festival”.